The artist looks like Mao. 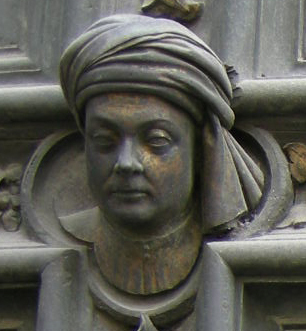 The 1401 competition for the creation of the gates of the Baptistery in Florence is often proposed as the starting date for the Italian Renaissance. Here are two self-portraits of the artist who won that competition, Lorenzo Ghiberti. The above one is from the northern gates (1403-1424 ca. ); the one below from the eastern gates (1425-1452 ca. ), which an awed Michelangelo dubbed Porta del Paradiso, gate of paradise. 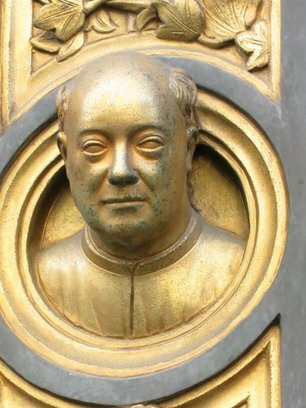 Here Ghiberti, now an established sculptor and architect, casts aside his turban, comes to terms with his baldness, and reveals that he looks rather like chairman Mao.